And all the endless ways you'll notice them in your cat. Show us the way you’ve noticed the 5 Signs of Wellness in your cat by tagging your photos on Instagram or Twitter with #5signsofWellness. See the 5 Signs of Wellness in your pet. 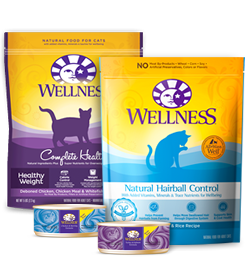 As always, Wellness® Complete Health guarantees your complete satisfaction. Click on each to see what they mean for your cat. Give your cat a soft coat that invites longer snuggles. Wellness Complete Health recipes all include guaranteed levels of Omega-3 and Omega-6 essential fatty acids from ingredients like salmon and flaxseed, as well as essential vitamins and minerals. Give her a carefree feeling she’ll sing about. Wellness Complete Health recipes are highly palatable and provide probiotics, prebiotics, chicory root extract and healthy fiber which enhance digestion. Give her bigger smiles, brighter eyes, and happier meows. Wellness Complete Health recipes help promote bright eyes, shiny teeth and healthy gums. Dental health is as important in cats as in people. Good dental hygiene shows up in your cat’s breath as well as her clean teeth and pink gums. And when your pet is healthy, her eyes are bright and clear. Give her energy for endless playtime. Give her the support she needs to feel like her playful self. Wellness Complete Health recipes are fortified with ingredients such as zinc, selenium and vitamin E to help maintain optimum resistance and health.